We love Mike the Knight in our house so there were plenty of happy dances when the new DVD arrived for us to review! This one has a magical theme - which went down really well with Blake (Aged 3) who currently likes to perform magic tricks - either by making a drink disappear when the audience closes their eyes or pointing something pointy (usually a wax crayon) at you and declaring abeereraarrcabeeurghaaa I turned you into a frog! Mike is very likeable and each episode always has a point to the story, a moral or something to think or talk about. and 'The Real Sword'. and runs for 72 minutes. Both my children enjoy watching Mike the Knight, theres something in the episodes that appeal to them equally and there were bits that made them roar with laughter - they both found it hilarious when Galahad was yellow and spotty! This has been a great source of entertainment during Blake's preschool half term! DVD on sale from 4 March 2013! Calling all pre-schoolers to the enchanted kingdom of Glendragon, a land rife with towering castles, fearsome dragons and mystical magic! Join Mike, Evie, Sparkie, Squirt and trusty steed Galahad as they embark on more exciting magical missions in new DVD ‘Mike the Knight: Magical Mishaps’, available from Monday 4th March with an RRP of £12.99. 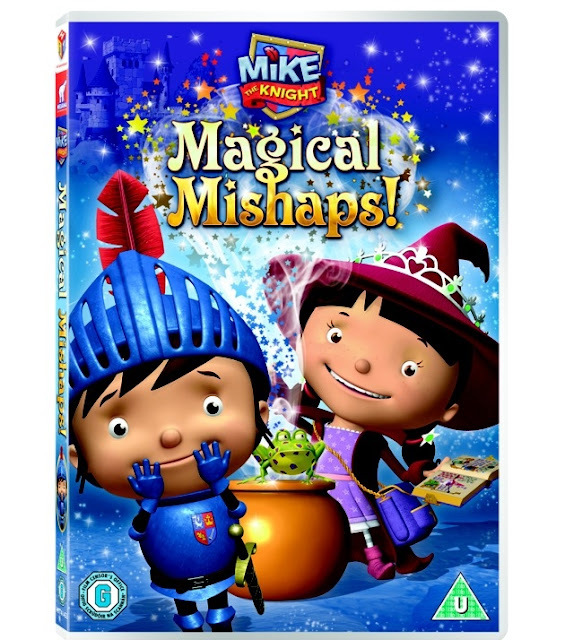 In this latest DVD release from the popular CBeebies series, Evie, Mike’s younger sister is a haphazard wizard in training. Wishing to become a full-blown wizard, she practices her magic at every opportunity. Accompanied by her pet frog, the master of mayhem Mr. Cuddles, Evie uses spells to help Mike with his missions. But things do not always go to plan resulting in a series of magical mishaps and Mike thinks his missions would be far better resolved using knightly skills, aided by his rallying cry ‘Be a knight, do it right’. I'm lucky enough to have been offered a copy of "Mike the Knight: Magical Mishaps" DVD for one of my lovely readers. To enter the competition, please leave a comment below telling me your favourite magic spell don't forget to include a way for me to contact you if you are the winner, such as twitter id or email please. The prize will be sent directly to the winner from the company supplying the prize. Open to the UK only please. Competition will close on Monday 29th April 2013 at 12noon. One winner will be selected using random.org, please reply with your details with 7days of winning or another winner will be selected. Has to be a rabbit being pulled out of a hat! My favourite spell is from Harry Potter: Wingardium Leviosa. Showing my age, my favourite is Izzy Whizzy, let's get busy! 9 years since our first official date!